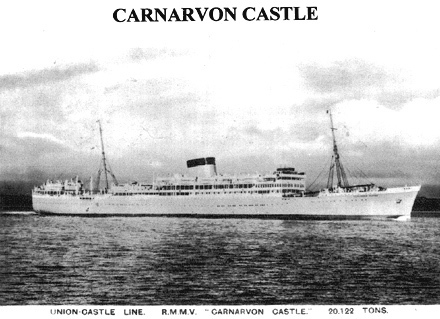 The Carnarvon Castle carried Polish DPs mostly women, children and the elderly from Rhodesia, Tanganyika and East Africa care of the Polish Military Authority in England. Calling at DURBAN and MOMBASA arriving in SOUTHAMPTON on 4th of May 1948. 162 JEMIEŁA Anna 22 Shop Asst. 169 KARKUT Amelia 21 Shop Asst. 170 KARKUT Helena 19 Shop Asst. 315 PAWŁOWICZ Wacław 64 Railway Emp. 360 SEROKO JÃ³zef 54 Commerce. 376 SROCZINSKI Franciszek Railway Emp. 1034 RYBARCZYK Antoni 56 Railway Emp.